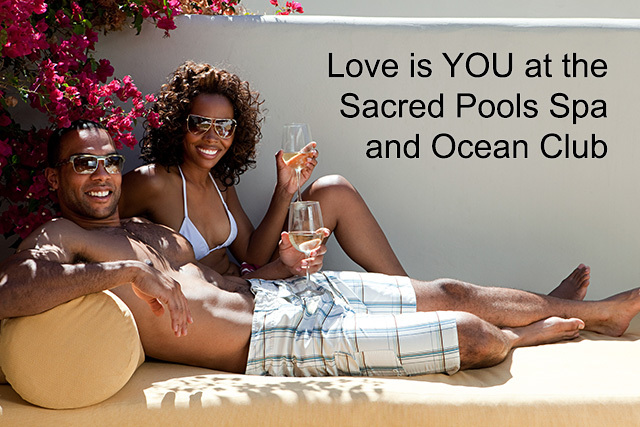 Sacred Pools Couple’s Spa Day Package- see why Maxim has called this the most romantic day in Las Vegas. Enjoy the entire day ALWAYS TOGETHER AND NEVER APART! Our specialty – the Sacred Pools Couple’s Treatment, a method developed at the renowned Sea Mountain Beverly Hills and Malibu Sea Mountain – A soothing deluxe 60 or 90 minute therapeutic massage done with two female therapists as you retreat side by side. We specialize in the ultimate massage experience that you can share with the person you care for the deepest. Swedish, Aromatherapy, Deep Tissue all combined for total therapeutic satisfaction. After your Couple’s Spa Day Treatment, drift in wave of bliss as you explore the wonders of the Sacred Pools and Hot Tubs and exciting areas of tranquil surrender. Today is Yours. Kiss the sky. Massage therapy. Today is yours. 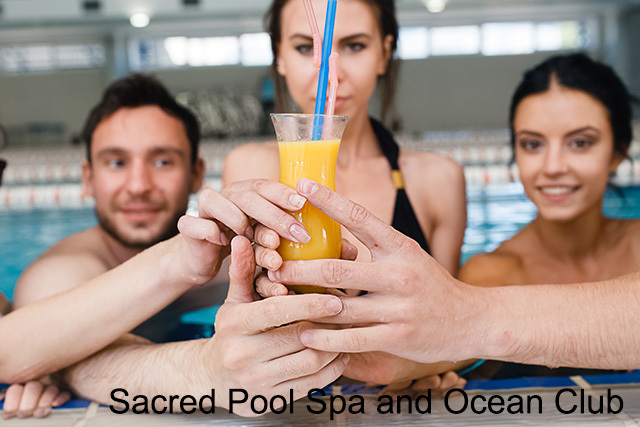 Enjoy a special massage with our highly trained and sensitive world class massage therapists – When you experience Sacred Pools Spa Treatments it’s like receiving a massage at your own private beach on the ocean. This is the ultimate in stress reduction. If you are seeking superior bodywork, relaxation, rejuvenation or a totally blissful break from life, we would like to extend our warm, sincere, and caring hospitality to you. Deep Tissue ~ Cross fiber muscle manipulation, meridian points contact. Swedish ~ Adjustable pressure using smoothing or kneading strokes. Reflexology ~ Meridian points on feet, hands and head stimulated rhythmically. Tandem Massage ~ Double the bliss and share the experience with your loved one. 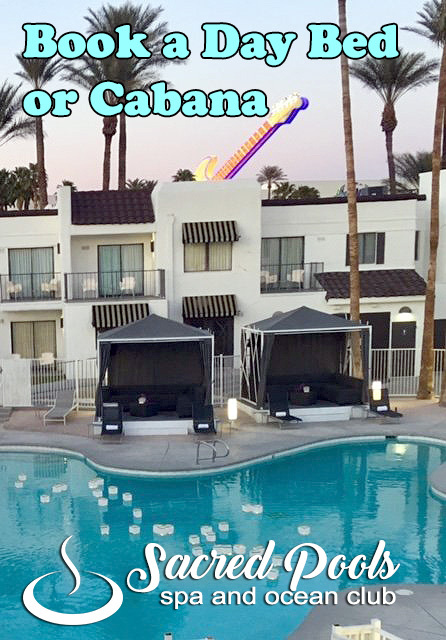 Our specialty – the Sacred Pools Couple’s Treatment, a method developed at the renown Sea Mountain Beverly Hills and Malibu Sea Mountain – A soothing deluxe 60 or 90 minute therapeutic massage done with two female therapists as you retreat side by side. We specialize in the ultimate massage experience that you can share with the person you care for the deepest. Swedish, Aromatherapy, Deep Tissue all combined for total therapeutic satisfaction. After your Couple’s Spa Day Treatment, drift in wave of bliss as you explore the wonders of the Sacred Pools and Hot Tubs and exciting areas of tranquil surrender. Today is Yours. Kiss the sky. Massage for one or two together. The Sacred Pools Couple’s Spa Day Package. At all other spas, friends or couples are separated for their treatments in different rooms. When you experience a Sacred Pools Couple’s Spa Day Package you are together for the entire day in showers, pools and bliss and never miss a moment together. Experience the best couple’s massage in Las Vegas. Each package includes a 50 or 90 minute Massage of your choice bubbly toasts, lunch. 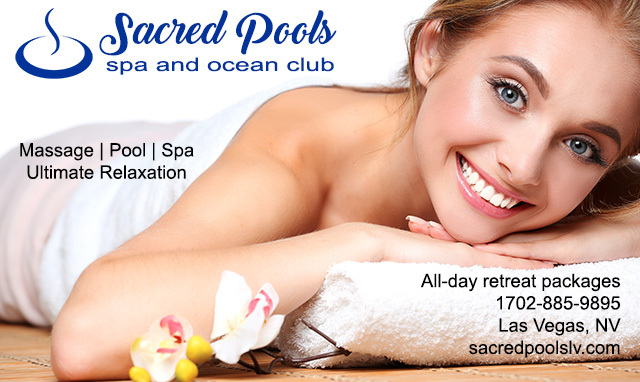 Feel the power of essential oils and detoxify with our Sacred Pools Specialty Body Scrub Treatment. Experience a unique blend of sugar scrubs and essential oils to polish and soften your skin while restoring and relaxing your mind. Our signature eucalyptus and lavender body scrub is designed exclusively for Sacred Pools from apothecaries around the world. Yes! You can come for a daybed or cabana and pool use at our Ocean Club even without spa treatments. Are you in Las Vegas for more than a day at the spa? How about treating yourself to the ultimate luxury health regimen designed by world-class therapists specifically for your needs. A regular massage treatment program has very powerful benefits that can enhance almost any routine including dieting and recovery, personal training, acupuncture, counseling, detox, infusion therapy, and oxygen therapy. Give yourself the gift of health and happiness with a twist of luxury. You know the post massage feeling where your mind is clear and your body is relaxed? An occasional massage leaves you feeling great, but regular massage can do so much more. The work your therapist does in each session builds on itself, helping your body maintain its relaxed state and your muscles loose even during times of physical and mental stress. Massage is the only luxury that your body truly needs and deserves. The uplifting power of massage can accomplish more in one session than years of alternate therapy. Don’t just treat yourself, heal and revitalize your soul. Ask us about our massage package sessions where you can book up to 4 weekly sessions at our private and exclusive spa as our top therapists soothe you back to strength with a customized treatment plan. Release your stresses and your tension for the day is truly yours. Book your appointments in advance and indulge yourself in an hour per week of personal bliss. Or bring your partner and package it for two with our Couple’s Program. Weekly or bi weekly massages make a huge difference in your overall well being and is proven to drastically increase the quality of your life. Don’t hesitate, don’t wait – your health and happiness always comes first. 2 50 Minute Swedish Massage Sessions for $110 each. $220 per package. 2 50 Minute Deep Tissue Massages for $130 each. $260 per package. 3 50 minute Swedish Massage Sessions for $105 a each. $315 per package. 3 50 Minute Deep Tissue Massage Sessions for $125 each. $375 per package. 4 50 Minute Swedish Massage Sessions for $100 a session at $400 per package. 4 50 Minute Deep Tissue Massage Sessions for $120 a session at $480 per package. Add an Aromatherapy Shower to your visit for just $30 for 15 minutes of a Eucalyptus Rinse to renew for another empowering day. All therapists are licensed by the state of Nevada and the city of Las Vegas. All massage is strictly therapeutic, and all guests will be draped in accordance with all laws and statutes.